Guido Rosani is a designer, fabricator and mechanical wizard in Torino, long of the Lancia world. His father, Nino Rosani, worked at Lancia and became the architect for the company, and was involved in many of the company’s showrooms and facilities. Nino Rosani was, with Gio Ponti, the designer of the Lancia grattacielo, and was also on the board at Lancia. While a young child, Guido was able to visit the drafting rooms of the racing team, and is quite possibly, the last link with the magic of Lancia’s 1950s racing efforts. 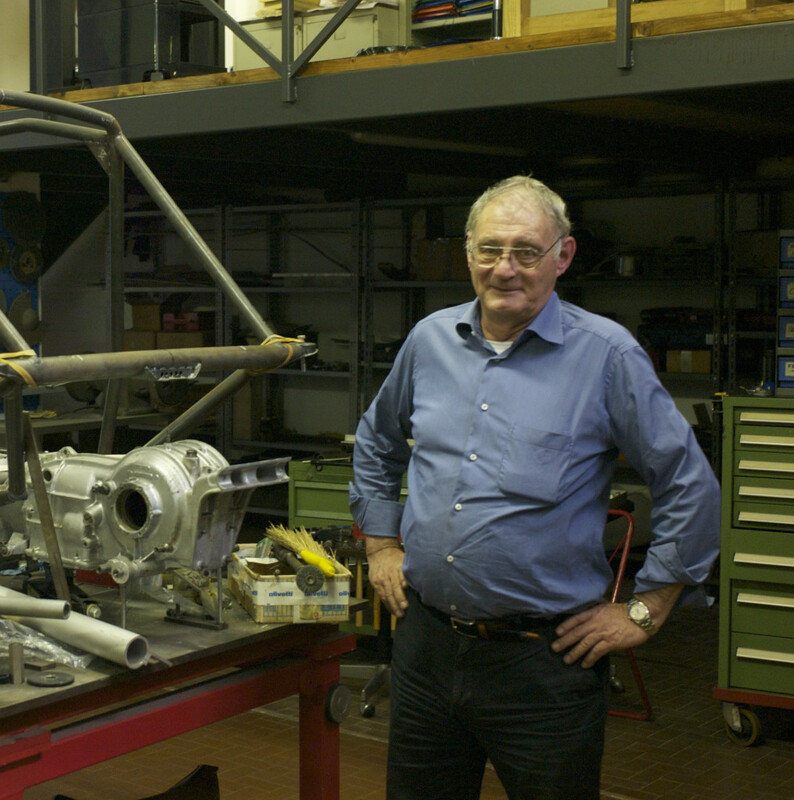 With the help of Anthony Maclean, Rosani was able to build several D24s and D50s in the past two decades. These used original (and sourced) engines, with much else found or fabricated in accord with the works drawings which Rosani had access to. These cars remain difficult for the car world to classify, as they are more than replicas, in one sense “continuations” as close to the original fabric as possible. Detailed and meticulous care was taken in their manufacture, as Rosani once told me that even the myriad baffle system inside the gas tanks (with hundreds of rivets) was redone when the cars were made – attention pain in areas where no one would ever know. Chassis No: 0001( R ) Engine No: 13The legendary ‘side-tanked’ Lancia D50 was by some margin the smallest and fastest front-running Formula 1 car of its era in 1954-55, and was the only one whose potential performance was genuinely feared by the dominant force of those days – the World Champion Mercedes-Benz factory team. Former double World Champion Driver Alberto Ascari drove the D50 to pole position upon its debut in the 1954 Spanish Grand Prix – the last Championship-qualifying round of that season – at Pedralbes, Barcelona, and early in the non-Championship Formula 1 racing calendar of 1955 he won both the Turin and Naples GPs in splendid style. One of the world’s oldest car manufacturers, Lancia always made cars for the connoisseur. The Lambda and Aprilia production models were among the most technically advanced cars of their day. Then in 1951 an almost standard 2-litre Lancia Aurelia Coupe finished a shattering 2nd overall in the Mille Miglia, beaten only by Villoresi’s mighty 4.1-litre Ferrari (after actually bettering the Ferrari’s times over the 1,000-mile public road course’s numerous mountain passes. This Aurelia model went on to win its class in the Le Mans 24-Hour race, finishing 11th overall. Full of enthusiasm, the youthful company President, Gianni Lancia, authorised a comprehensive factory racing programme which produced the now immortal Lancia D24 sports-racing design. This spectacular car with flowing Pininfarina body, 4-cam V6-cylinder engine, rear-mounted transaxle gearbox and inboard brakes both front and rear, won the 1953 Carrera PanAmericana classic in Mexico (Fangio, Taruffi and Castellotti 1st, 2nd and 3rd) the Mille Miglia (Ascari) and the Targa Florio (Taruffi). Against this imposing background, the stage was set for Lancia to enter Grand Prix racing. 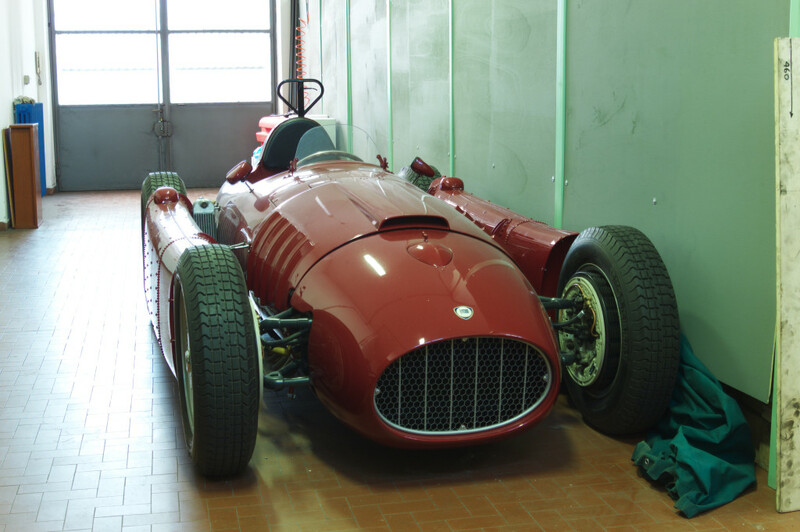 The Lancia D50 was the most innovative front engined Grand Prix car of the 1950s and arguably also of the previous 30 years. Designed by Ing. Vittorio Jano, legendary creator of the pre-war 8- and 12-cylinder Alfa Romeo racing cars, the compact D50incorporated a host of technical innovations, representing a clean-sheet-of-paper approach to Formula 1 car design which was of quite astonishing purity and elegance. Its most obvious visual features were the two outrigged pannier fuel tanks slung from the chassis sides between front and rear wheels, not only to provide uniform fore-and-aft weight distribution and balance between full and part-consumed fuel load, but also because aerodynamic studies had indicated to Lancia that such fuel tanks between the wheels would smooth turbulent air flow, and reduce aerodynamic drag. But there was much else besides. This was the first use in a World Championship racing Formula 1 car of a V8 engine and the first time that such an engine was used as a stressed structural member of the chassis frame. The power unit was mounted in the chassis only via the cylinder heads. It was angled to allow the driver to sit beside instead on top of the propeller shaft, thus lowering his seat to minimise the car’s cross-section and aerodynamic frontal area. Contemporary photographs show the drivers of conventional Ferrari and Maserati Formula 1 cars sitting several inches higher than Ascari, Villoresi, Castellotti and the other Lancia D50 drivers. Not only were these transcendant Grand Prix cars low-slung, they were also short and compact, the smallest of their era apart from the uncompetitive early-style Gordinis. Transmission was via a 5-speed transaxle with syncromesh on the top 4 gears. Jano’s design team had also envisaged, but never finalised, a sequential gearbox and direct fuel injection. The beautifully finished, stubby little car weighed only 610kg. Delicate detailing abounded throughout, including intricately machined front suspension parts and inboard shock absorbers operated via drilled rocker arms. Every part was studied for lightness and the elegance of the Lancia craftsmen’s work followed the purity of the Jano team’s design. To many the Mercedes- Benz W196, the only true rival to the D50, appeared a more massive design, however masterfully executed. The D50’s development took many months, before its belated debut at Barcelona in October 1954, but there the new works cars simply stunned rivals and spectators alike with their speed and handling. The Lancias, reported Rodney Walkerley in The Motor were “rockets on wheels”. In the race Ascari simply drove away from the field at the rate of 2 seconds a lap. At the end of the 9th lap, already 20 seconds ahead, Ascari was forced to retire due to oil on the clutch lining from a faulty casting. On March 27, 1955, Ascari won the Turin Grand Prix with the improved D50A, with the sister team D50As of Villoresi and Castellotti 3rd and 4th. The D50s placed 2nd and 4th at Pau in April, then 1st and 3rd at Naples before confronting the Mercedes on May 22 at Monaco. Ascari qualified his D50A on the front of the grid, then led momentarily before crashing into Monaco harbour in a cloud of steam. He survived, only to die within days, testing a Ferrari. Castellotti placed 2nd. Disheartened by the loss of their great Champion and exhausted by the effort and cost of their single-minded quest for racing success, Gianni Lancia and his mother Adele were losing control of their company. Castellotti – as a private entry – put the D50A on pole position for the Belgian Grand Prix at Spa in June but failed to finish. With Fiat’s intercession, the Lancia Corse racing team was then closed down, and its cars and associated material presented to Ferrari – founding the World Championship-wining Lancia-Ferrari series for 1956. The original Lancia D50-series cars were dismantled and in large part broken up apart from two examples which survived in non-operational, partly incomplete form in Italian museums. In the early 1990s great Lancia enthusiasts, Guido Rosani, born and bred in Turin and Anthony MacLean, an English lawyer living in Geneva, met and discussed a hugely ambitious project to re-create the D50s. MacLean had successfully campaigned a LanciaD24 sports car re-created in Turin by Rosani and colleagues in Historic events in Mexico, Tasmania, Sicily and throughout Europe. Rosani had a full set of Lancia drawings and much data, including details of the components of every car built, plus test-bed and race data, even including the spidery hand-written report by the Lancia team manager on Ascari’s victory in Turin in 1954. Time, patience and help from Sir Anthony Bamford – who had preserved some original V8 engines and transaxles bought from Ferrari years before – laid the foundations for this project. Further searches in Italy unearthed more engines including, astonishingly, one complete original unit, still in its Lancia Corse packing case, complete with 1955 dyno tags. The rare missing Solex carburettors and correct Marelli magnetos were tracked down subsequently. No effort was spared to make the cars correct in the smallest detail. Not only the factory drawings and data were employed, but also the surviving complete car which the Lancia museum kindly loaned for inspection and dismantling. Instruments were re-manufactured by Allemano, the original supplier, exactly to the original design. Wheels were re-made by Borrani to the original pattern. Some original suspension parts were located. The bodies were hand-made in aluminium in Turin by contemporary ex-Lancia craftsmen. The run of five cars to D50A specification today re-unites original engine and transaxle combinations which were first united in 1955, each individual chassis being given the correct original number with ‘R’ suffix to denote ‘reconstruction’. Attention to detail has been extraordinary, including for example, hand manufacture of each of the delicately drilled and fretted fuel tank/strut brackets – five cars, eight brackets per car, forty in all, each one different to the next…The finished chassis and bodies were shipped to England where surpassing pains were lavished on re-building of engines and transaxles and race preparation of the chassis by Jim Stokes Workshops, well-known for many years for work on Alfa Romeo racing cars including the Alfetta 158, and also on the BRM V16. Only departures from original specification have been invisible and in the interests of either safety or longevity and practicality. The original engine block proudly carries its Lancia date stamp – ‘11/11/54’ – and as rebuilt it has been dyno-tested to c.235bhp, closely matching the output recorded on an original Lancia test sheet, dated June 24, 1955, just a month before the transfer to Ferrari. The unit’s original originally fragile threaded valve stems have been improved upon, and the units built to offer several seasons’ reliable service without need for a re-build after every race as in 1955. The fuel tanks incorporate modern rubber bags to current FIA specification, while the multi-finned drum brakes now feature twin-circuit actuation. A small roll-over bar has been discreetly built-in. The cars have been track tested and set up by a well known historic racing driver and have been prepared to race – not merely as the beautiful artefacts they also, undeniably, are. Of the five cars built, one is in the Donington Collection in England, another in a private museum while a third has been extensively raced over the past season. The car offered here is the last produced and is the property of one of the original partners in the project. It participated in this year’s Goodwood Festival of Speed and has been invited to take part in the Goodwood Revival Meeting the weekend of this sale. No pains have been spared to incorporate every lesson learned in building the previous cars and to make this car, which has no hours on it at all, apart from careful dyno and track-testing, as near as possible to the new car in which Ascari sat in 1955. It is finished in exactly the correct shade of deep Lancia maroon – rosso granata (?spelling??? DCN) – matching that of the hometown Torinese football club, Juventus.